When it comes to Marketing or your Personal Brand what is your “right page last panel”? Before I became one of the worlds smartest and most handsome word of mouth mark eters I supported myself (not very well I might add) for a bunch of years as a comic book writer and publisher. A lot of what I know and do today was learned in those years and one of the biggest lessons I am going to share with you now. Now this is going to seem like a lesson on writing a comic book (and it is) but the message is the same for marketing or personal branding so pay attention. People used to ask me all the time what the secret to writing comic books was. My answer was always “Right Page Bottom Panel”. Basically when people are reading a comic book or any book they read left to right and top to bottom. 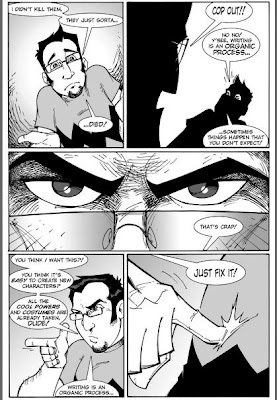 So using that logic you should write your book with a reveal in the first panel of the left page and a cliffhanger or just something interesting on the “right page bottom panel”. The best way to use that last panel is to be interesting and even pose a question or something that makes people want to come back for more and be surprised on that next page. OK I will make it more clear by asking you a direct question. Using this little lesson you should ask yourself…What are you doing in your marketing or personal branding that is making people want to keep coming back for more…and are you living up to the reveal on the next page? I hope so because I love a good reveal! ANd now you feel loved and validated, Saul. Very unusual perspective. Are you sure comic viewing is alway left to right? When you view a painting, your eye follows the perspective around. I know you were relating it to writing, not pictures, but you used your comic as an example. Is marketing a person closer to reading, or more like viewing art? …and I don’t know if marketing is more like reading or art…I think each situation is different and depends on what you have to work with. Very cool concept, Saul, and something that should be obvious to those of us in marcom, even if we’re not comic book junkies (I’ll admit, I’ve got a stack in storage from back in the day). After all, that’s what a compelling message is all about, right? You want ’em begging for more.